this weekend we’re again gonna go to gensingen, to take part in a masters competition of the ssv ingelheim. 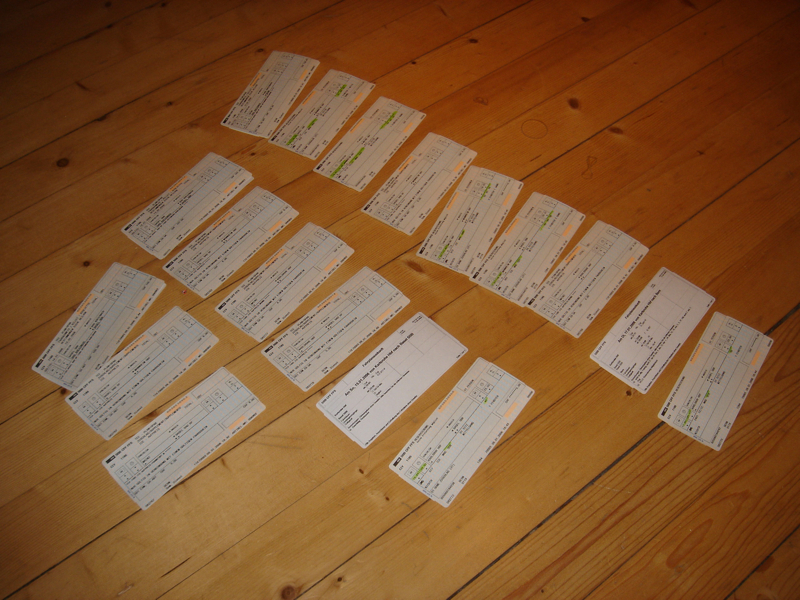 today i went to buy our tickets (three people; pesche and another guy from basel and me). as you can see in the image to the left, it was rather a big undertaking. the problem is that we all have different schedules: i’m starting in bern, the two others are starting in basel. then we proceed all together to gensingen. on sunday we travel back home together, but only until karlsruhe. pesche and me are stopping there, to visit an old friend (rouge, you know him too, it’s mike bucko…). the third man is directly going home from there. pesche and me are having diner with mike and then pesche is gonna go home to be ready for his work-week. since i got two days off work, i’m gonna stay a bit longer and enjoy karlsruhe. in the end it turns out, that we need 21 slips of paper for that journey. not too bad, aight? (yes, i know that you can only see 18 of ’em, three of them are stapled to three others).